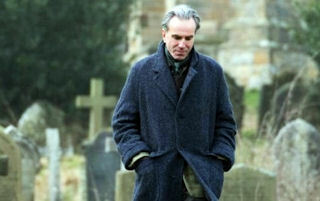 Review: Phantom Thread / It's Just Movies Review: "Phantom Thread"
Announced by Daniel Day-Lewis as his last film, the three-time Oscar-winner has opted to go out with dignity and grace. Nominated for a Golden Globe, and backed up by a Globe-nominated score by Jonny Greenwood, watching “Phantom Thread” is like walking through an art museum with a symphonic orchestra playing on the mezzanine. It exudes the gratefulness of a legendary artist happy enough to be taking a rest. It remains to be seen if such a thing is possible. The restfulness will be a disappointment to those who revered Day-Lewis for his pounding rhetoric in “There Will Be Blood,” “Gangs of New York” and the like. As dressmaker to royalty, Reynolds Woodcock has grown to become his own worst enemy. He becomes angry even in total success. His shortcomings, few and far between, leave him apoplectic. Brain cells totally focused on his work, the slightest upset is enough to spoil his entire day. His first breakfast with lover Alma (Vicky Krieps) threatens to, in his own words, spoil his day and possibly his life, when she makes an unusual noise spreading butter on toast. He needs a change, and Alma is going to give it to him. The change is not given as in “The Sound of Music,” with little bit of sugar to help the medicine go down. Nor is it a sweet trimming of the wings as in “Hello Dolly.” Instead, Woodcock will be forced to deal with Alma mano-a-mano on the field of heroic battle. While his sister, lifelong companion, professional assistant and surrogate wife Cyril (Lesley Manville) looks on, Alma and Woodcock take off the gloves for a showdown, “Gangs of New York” style. One can almost see the poor man being fish-hooked. If the movie is slow as a wake in parts, the luscious analog photography is so beautiful few will care. Each frame is constructed like a haute couture gown by director Paul Thomas Anderson, who also shot the film. The cinematography consists almost entirely of interior shots, each with the smallest detail, grain, warp and weave attended to. In many of the sequences the textures of the skin, eighteenth century wood, discolored plaster and, especially, the cloth tell an entire story by themselves. The fourth collaboration between director Anderson and composer Greenwood and the second between writer/director/cinematographer Anderson and Day-Lewis, the acting, sound and visuals are as tight as a rock power trio. The budget was gigantic and the studio put the money into the ultimate in production quality, while trimming the key cast and crew to the minimum. If not the blockbuster to end all the other blockbuster Day-Lewis movies, this film shows what a work of art a movie can be. Despite the lack of a riveting plot, there is a cozy warming to be experienced by simply absorbing the depth and understated wealth of beauty passing by.